Trinidad & Tobago was ceded to the British from the Spanish in the very early 1800's, and its first flag, like so many others in the British Empire, used a Blue Ensign. This was charged in the fly with a disc.Inside the disc is an image of a ship arriving an a bay at the foot of a mountain. Then, with a wave of fervour for independence sweeping the Empire, Trinidad & Tobago was joined with many other British Caribbean territories to form the Federation of the West Indies. 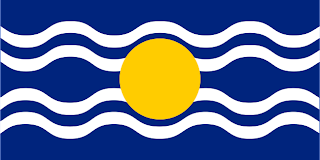 The flag for this federation featured 4 wavy white lines on a blue field, representing the waves of the sea, and a yellow disc placed in the centre. This federation did not last long, as Jamaica did not want to be the economy left supporting the Federation, and withdrew. This led to the collapse of the Federation in 1962. This was the same year that Trinidad & Tobago was able to gain its independence from Britain. Led in large part by the fact that the islands feature a strong industrial economy. The flag of the new nation is a red banner, with a black stripe running from upper hoist to lower fly. Edged in white. The red represents the people of Trinidad, the black represents their unity of purpose, and the white represents the seas round the islands. Also, the colours represent earth, fire, and water. Three of the natural elements.